THE Henley 60+ Social Club has received more than £12,000 in donations in the past month. Ann Manning, who runs the insurance brokers of the same name in Reading Road, donated £10,000 after reading about the club having a deficit in the Henley Standard. Treasurer Sue Bishop had told a Henley Town Council meeting that the club had a £5,000 shortfall in its budget this year. Gill Dodds, chairwoman of the management committee, said: “Sue very kindly spoke to the council to give a report on the club and explained we try to run a balanced budget but this year we had a deficit. “That got some publicity in the Henley Standard and within a couple of days I received three responses. “The first was from Ann Manning, asking if that was the case and offering us £5,000. “The next day she rang and asked if anyone else had come forward and when I explained, she said, ‘In that case maybe I can be more generous’. She gave us £10,000. Funeral directors Tomalin & Sons, also in Reading Road, have given the club £2,000 to be added to general funds or be used for a specific project. The club, which is based in Greys Road car park, will also receive £500 from Bluebird Care Concern. Mrs Dodds said the club had a successful year running events with help from the Henley Festival and the Tony Lane Foundation, named after the late former mayor o and club member. The club also had a new kitchen installed, which was donated by Jewson in Reading Road. Mrs Dodds said: “The credit goes to Elizabeth Hodgkin who went into Jewson to ask them if they were going to throw the kitchen away. The club was founded in 1971 and has more than 100 members who each pay a membership fee of £15 a year. It opens every weekday from 10am to 4pm and holds activities such as bingo and computer lessons and arranges outings. A key part of the offering is lunch three times a week, on Monday, Wednesday and Friday, which the club makes sure is “affordable”. It is also supported by the Henley Handybus charity which picks up and drops off members. The club is also considering allowing non-members to come in and have lunch or use the hairdresser. They would pay a higher rate than members. The club is going to trial the non-members service for hairdressing and lunches for three months and review it at the next management committee meeting in November. The town council owns the building and pays an annual grant of £10,000 towards its running costs. The club spends about £36,000 a year on staff, including managers, a chef and a cleaner. In addition to the town council grant, investment income brings in about £10,000, although this is down on the £20,000 it used to receive in 2008 before interest rates fell. Town councillors Stefan Gawrysiak, David Eggleton and Sara Abey are also on the management committee. 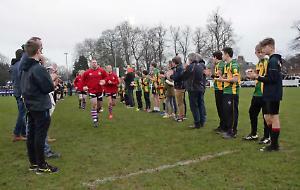 Other businesses, such as Stuart Turner and the Henley Standard, as well as the Henley Festival also support the club.